I’m in the minority of people that like sprouts, and I think it’s a shame that I only eat them once or maybe twice a year. They are a bit of a pain to prepare, but then so is an avocado and they’re the cool kid everyone wants to be BFFs with. In comparison the humble sprout is the geeky quiet kid in glasses that everyone shuns. But, just as the geeky kid in most teen movies gets their girl/boy/new found popularity delete as appropriate), I’d like to see the sprout have its day. I think a lot of the bad press with sprouts is that they’ve been sorely mistreated. Some chefs will be bringing theirs to the boil now, ready for Christmas 2018! Others will wait until 11:52 on Christmas morning, and they’ll be so hard you’ll need to wear safety glasses while attempting to get them on your fork, in fear of a stray sprout pinging off your plate and whacking you in the eye! If I’m having sprouts with Christmas dinner, I like to gently part boil them, then stir fry them in a wok with a bit of chorizo. The flavours work really well together. Chorizo makes everything better, so even the sprout haters in my family find these palatable. I’ve embarked on a low carb, high fat diet for the new year, and being allergic to eggs and dairy, breakfast is a particularly tricky meal for me. When I tried this diet a few years ago I had cold meats and dairy free cheese for breakfast, which was ok, but not great on a cold January morning. I scoured Pinterest trying to find something suitable to try, and came up with nothing. So I turned to my cupboard of recipe books and remembered that a few months back I tried Hemsley + Hemsley’s bacon and bean hash, which was nice. However for the first two weeks of the diet beans should be limited, so I got my thinking cap on for ideas of how to bulk the recipe out. My mind said sprouts. And why not? They’re in season, they add flavour and bulk, and I know they work in bubble and squeak. So I pimped the recipe slightly, and cake up with my own breakfast bubble and squeak. Really you can add whatever you fancy, but I used chopped streaky bacon, onions, celery, white cabbage and sprouts. I part boiled the sprouts so they were easier to mash into the mix. I stir fried the mixture until it was begging to brown in places, and added a little hot paprika, ground cumin, salt and pepper. I served it this morning with a couple of slices of black pudding. Yum! Just what I needed at 6am on a chilly Monday. I’m hoping it will keep me going until lunch time. Lunchtime. Lunches can be terribly boring for someone with allergies. The choices are generally very limited. Soggy salad? Dry sandwich? 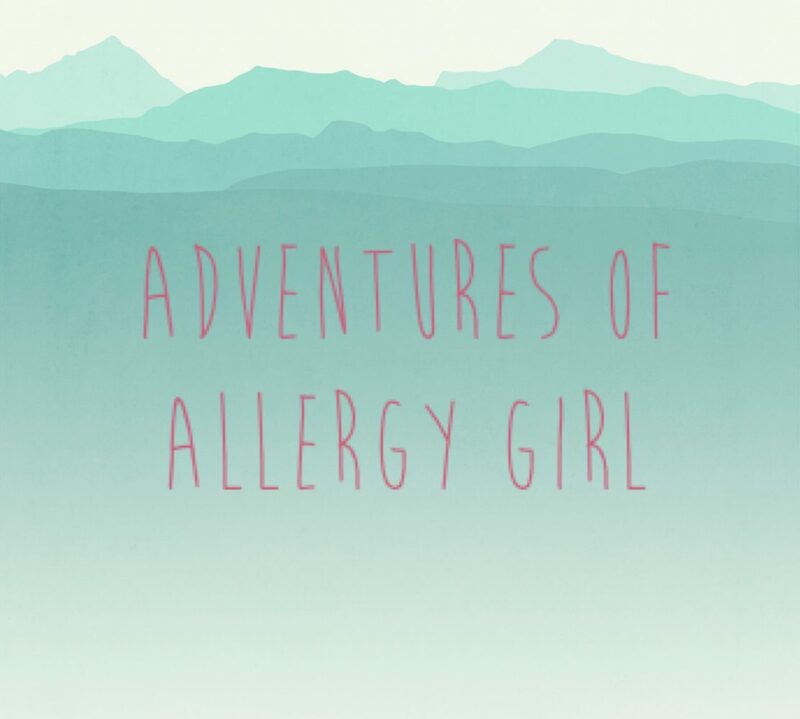 Not for Allergy Girl! This is a great weekend treat (and a firm favourite of Mr Allergy). I first tried this one sunny June day. Having just completed the Portsmouth Sprint Triathlon in my best ever time (still a snail’s pace, but I tell myself it’s because I only have little legs), I fancied something substantial to eat. Somehow we stumbled across chorizo on toast, and it was a revelation. Mr Allergy and I love chorizo. It’s a major food group in the Allergy household. It goes with everything and improves everything it touches (apart from white clothing, this should be avoided at all cost). Here is my take on the fabulous post-Triathlon dish that changed my world. I hope you enjoy it! While the chorizo is cooking, slice and toast your sourdough. I do this in the toaster on a low-medium setting. One the toast is ready, assemble your masterpiece. I like to put the chorizo on first, next add the peppers and top with the rocket. Drizzle the chorizo oil from the pan over the top of the rocket and serve. Add olive oil or your favourite condiment. It works well with chilli and garlic oil, or garlic mayonnaise for those that can eat mayonnaise.